Staff presented the Leicester project for space and space-enabled industries at the Labour and Conservative party conferences. Headlines have been filled with revelations from the Labour and Conservative party conferences these past two weeks, but behind the scenes it was the politicians making the discoveries as Space Park Leicester touched down in their Liverpool and Birmingham venues. Space Park Leicester joined Midlands Engine and Midlands Connect at both conferences, showcasing the business opportunities that the region has to offer. Staff from the University were on hand to chat with fascinated visitors, including several ministers, about Space at the University and the opportunities provided by Space Park Leicester. The future direction of the UK space sector, the benefits of a ‘Low Cost Access to Space’ (LOCAS) satellite Facility and Space Park Leicester’s capability to deliver against national, regional and local strategies for economic growth were the key messages our staff were sending to politicians, policymakers and influencers. The Labour Party Conference took place from 23 – 25 September at ACC Liverpool, where the Space Park Leicester stand caught the attention of both John McDonnell MP and John Ashworth MP. Professor Paul Monks, Head of the College of Science and Engineering, was invited to speak at the Midlands Engine fringe event on 24 September alongside Sir John Peace, Chair of Midlands Engine. The following week was the Conservative Party Conference from 30 September – 3 October at ICC Birmingham, where our staff found themselves speaking to cabinet ministers, such as Greg Clark MP, Sajid Javid MP, Gavin Williamson MP as well as prominent Conservatives Rupert Matthews MEP, Alberto Costa MP and David Willetts. Professor Iain Gillespie spoke at the Midlands Engine fringe event on 1 October alongside Sir John Peace, and two Secretaries of State – James Brokenshire MP and Chris Grayling MP. He is pictured right, with Maria Machancoses, Director of Midlands Connect; Fiona Piercy, Fiona Piercy, Midlands Engine Programme Director; James Brokenshire MP; and Sir John Peace. The presence of Space Park Leicester coincided with the submission of the planning application for Phase 1 of the exciting new development, announced by the University this week. 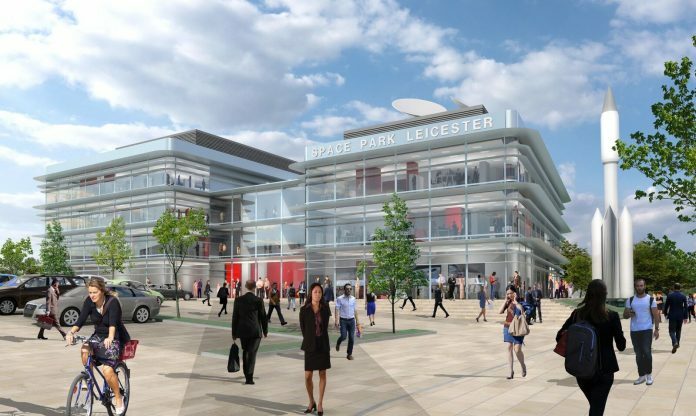 Based in Leicester, the Space Park is a partnership between the University of Leicester, the National Space Centre, the City and the Leicester and Leicestershire Enterprise Partnership (LLEP).